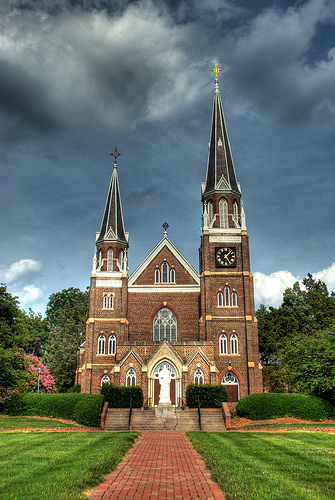 Belmont Abbey College, located in Belmont (Gaston County), is a Benedictine Catholic college that was founded in 1876. In that year, Father Jeremiah O'Connell purchased the 500-acre Caldwell Place, and under the sponsorship of Abbot Boniface Wimmer and the Benedictine monks of St. Vincent Abbey in Latrobe, Penn., the order established a monastery and college. Four students constituted the college's first class. Nine years later, in 1885, Abbot-elect (later bishop) Leo Michael Haid came to head the fledgling school; he would serve as abbot and president of the college until his death in 1924. In April 1886 the state of North Carolina chartered the abbey/school as Saint Mary's College with degree-granting status; in 1913 Saint Mary's adopted the Belmont Abbey name. Under the leadership of Vincent George Taylor, a Virginian who succeeded Bishop Haid as abbot and president of the college, Belmont Abbey, though temporarily reduced to junior college status, was accredited by the Southern Association of Colleges and Schools in 1936. In September 1952 the college resumed offering bachelor's degrees and was accredited as a baccalaureate institution five years later. In 1970 Father Edmund McCaffery assumed the role of abbot nullius and college chancellor while Father John Bradley became the first non-Benedictine president of the college. It was during McCaffery's and Bradley's tenure, in 1972, that women residents were first admitted to Belmont Abbey. During the 1990s the college initiated a master's program in education and restored the Lourdes Grotto. The 650-acre complex is home to the college, the monastery, and the Abbey Basilica. By the early 2000s, 40 full-time faculty members served a student body of approximately 1,000 students in pursuit of a wide variety of undergraduate degrees, some through the Adult Degree Program. Paschal Baumstein, A Carolina Basilica: A History of the Monastic Church at Belmont Abbey, North Carolina, Belmont, North Carolina (1999). Baumstein and Debra Estes, Blessing the Years to Come: Belmont Abbey-A Pictorial Perspective (1997). John P. Bradley, The First Hundred Years: Belmont Abbey College (1976). Johnson, Douglas. 2009. "The Monastery at Belmont Abbey College in HDR." Online at http://www.flickr.com/photos/carolinadoug/3714061461/ Accessed 10/29/2012.